Either roast or boil the potatoes with the skin on until tender. Cool slightly and then peel. Place into a bowl and add the peppers, goat cheese, basil, thyme, olives, salt and pepper to taste. Pour in the eggs, and mix all very well. Set aside. Bring a pot of water to a boil and blanch the chard leaves to soften, about 30 seconds. Place in ice water to stop the cooking. Drain and pat dry. Fill each chard leaf with 1/4 cup of the potato filling. Fold up the sides, and roll them up. Place all the rolls on a baking sheet, and drizzle with olive oil. Place in a 300 degree oven and bake until heated through, about 25 minutes. Combine the remaining olives, vinegar, mustard, and olive oil. 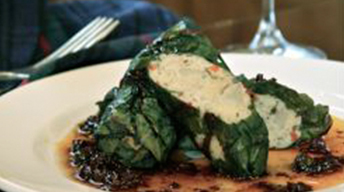 Whisk together to emulsify and serve over the chard rolls.